Having introduced you to Rosalena Skincare & it’s inspiring founders, Maja Griffith & Helena Chapman, in part one of my post about the brand, this post is logically dedicated to my review of the Face Oils & Mist that I have been using since September, after I attended Joanna Hynes‘s fashion show at the London Fashion Week, as Rosalena’s guest. It was made even more memorable not just by the initial conversation that I started with those two very talented & inspiring women, but by observing Helena in her unbridled enthusiasm, as she energetically sprayed models & the team working on the show with the uplifting Goodness & Tonic Face Mist. Calm, creativity and beauty reigned supreme! Rosalena has four Face Oils for you to choose from, each with an original name: Love & Me, Rock & Rose, Beauty & the Beast, Frank & Sense. Each was developed to offer specific benefits to your skin, irrespective of your age. The decision ultimately lies with you, because you need to know your skin type & assert your skin’s needs by looking in the mirror each time you do your skincare routine, be it morning or evening. Oils used to get a really bad reputation, based on presumption that they clog your skin, but in the last few years things have been changing. Of course a lot depends on the quality, as well as the combination of ingredients in the one you choose to use, but generally speaking, oils help hydrate our skin and make it look more luminous when used on their. This was the first oil with which I started my discovery of Rosalena skincare and it remains one of my personal favourites within the range. Exterior packaging, by the way, is something that makes Rosalena stand out instantly. Each box has a bright colour, making one oil be instantly visually distinct from another. When you open the box and glance inside – hello yellow, purple, pink & reddish coral, depending on the oil you choose, not only there is a bottle with the product & a practical pipette to dispense the exact amount of oil for single use, there is also a brochure telling you about the range, specific oil, as well as ingredients. Knowledge at your fingertips makes life easier, that’s for sure, as well as helps you make better skincare choices for yourself. ‘A skin nurturing active formula for gentle hydration with natural beauty boosters for even the most sensitive skin’ is how it is described on its interior packaging. High in Vitamin A & Omega 3,6 & 9, Love Me oil aims to improve skin tone by reducing redness & nourishing skin cells for a radiant complexion. It feels rich to the touch, has great ‘slip’ factor & glides easily all over your face & neckline upon application. The balancing blend of Evening Primrose, Grape & Baobab Seed oils, as well as Rosehip CO2 seed & Rosemary Leaf extracts, helps to sooth the skin, as well as refine skin’s texture. As it is suitable for all skin types, you can try to use it even on sensitive or stressed complexion (please do a patch test first though!) and see if over the course of a few days you skin will start looking less stressed & more supple. You can also use this oil on your daughter’s teen skin, during the time when hormones might be having a negative impact on skin’s appearance & her inner confidence. I used it day & night & noticed that it acts as a great base for make-up application. It also made my skin feel softer & plumper within minutes. I tend to apply it to slightly damp skin after cleansing, let it sink in and then apply my usual BB or tinted cream on top. Maja & Helena recommend generous oil application to your face, neck & decolletage in the morning or nighttime, as well as a few drops as ‘a midday pick-you-up’, when you skin feels & looks lacklustre. It doesn’t leave shine & sinks in quickly and its gently uplifting scent of refreshing Rosemary & feminine Rosa Damascena is bound to revive tired senses as well. Lemony yellow in colour, Maja & Helena call this oil the ‘S.O.S of skincar, a perfect face oil for the morning after the night before. Created to boost radiance & enhance skin’s luminosity, it has multi-tasking ingredients to give you healthier and glowing skin. Something that might not be on top of your list in your 20s, when you are flushed with gorgeousness of youth, but that changes once you hit 30 and life becomes faster & with a bigger load of responsibilities. The oil is quick to absorb & helps to keep skin shine-free, while hydrating it. The formula is also full of vitamins & antioxidants, making this oil a good all-rounder not just for days when your skin isn’t looking its best. Pumpkin Seed oil helps to give skin a little natural lift, while also smoothing & toning it, cutting out the need for using the toner as part of your skincare prep. That is not to say, of course, that you can’t mist your face during the day or in the evening, after thoroughly cleansing your skin. Safflower oil helps to hydrate the skin thanks to oleic acids, which also help to brighten sallow skin tone. Prickly Pear Oil is conductive to collagen production that slows down as we age, so if you notice that your skin is starting to loose its elasticity, this is a good ingredient to add to your skincare. Grapeseed Oil, natural Vitamin E & CoEnzyme 10 add antioxidants to help fight daily free-radical damage, as well as assist our skin with renewing itself more efficiently. Your nose & mind will respond to the olfactory benefit of Jasmine Absolute, Sweet Orange & Rose Otto combination, hopefully making you feel more happy & in-balance with yourself. This is something that is particularly appreciated by me as a mother, trying to frantically paddle between raising a family & following my work-related ambitions. This oil is a treatment oil aimed to be used all around the year to hydrate, repair & nourish your skin. 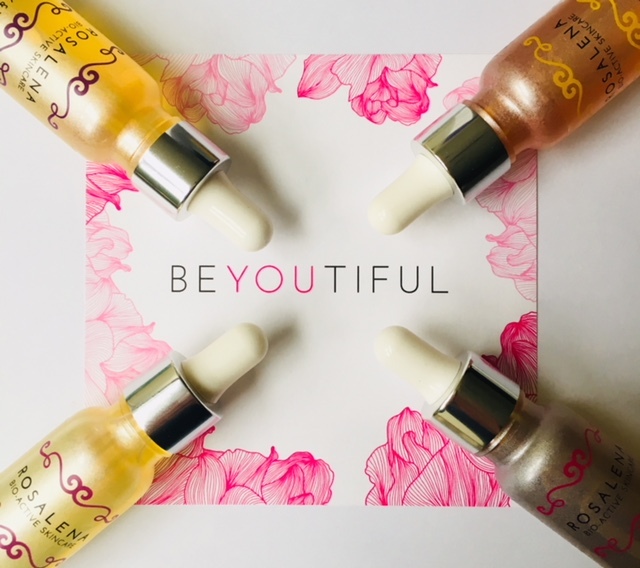 Whether you are spending time on the beach, sunning yourself or speeding down a snowy mountain on skies or doing the school run on a damp morning, this bright yellow oil will charm you with its eye-catching colour, immediate sinking into your skin & the nurture it provides you with, creating an invisible bubble of energised contentment. Rich in antioxidants, beta-carotenes & bio-active extracts it will not only nourish your skin, but help repair it after exposure to adverse elements, from sun to frost. A natural anti-inflammatory it will calm aggravated skin and redness, support collagen production & mop up damage from the free-radicals. When you put a few drops of the oil into the palm of your hand & warm it up as you massage it on the skin, you will notice the richness of the texture, but within a few masterful strokes it will sink into the skin, leaving behind a veil of contentment, as you can almost hear the skin whisper a ‘thank you’. Personally I prefer using this particular oil at night – before starting dinner prep, I go to the bathroom, cleanse & tone my face, apply the oil, taking a few deeper breaths, with longer exhales, which allows me to calm & ground myself, while enjoying the evening skin ritual. Then I smile at my own reflection in the mirror & go to cook for my family, knowing that my skincare is hard at work, nurturing my skin & if not reversing the signs of ageing, then giving it the care it deserves. In terms of ingredients in this oil formula, it’s worth highlighting Buriti Fruit Oil, packed with essential Fatty Acids, Vitamins E & C & Beta-carotene, which hydrate, regenerate & sooth the skin, as well as support collagen production & calm down the redness, particularly useful when you are experiencing hot & cold temperatures. There is also Calendula Oil, which works well on dry & irritated skin and Organic Seabuckthorn Pulp CO2 Extract (helps rejuvenate skin cells & mops up sun damage). Thinking not only about female customers & in some ways being guided by their own husbands, Helena & Maja consciously created this unisex face oil, taking male skincare needs on board as well. Loaded with antioxidants, the oil is easily & quickly absorbed by the skin, while hydrating it, without leaving behind any signs of unwelcome shine. Having a skincare product in your arsenal, which cuts out the need for make-up primer or a post-shave calmer for the men in your life, will save you a little bit of time time in the morning, allowing you to linger over your morning cuppa, which can only help you stay better focussed as the day unfolds. Pale yellow in colour, this oil has a fairly light, if not neutral scent, which makes it appealing to both sexes or for those of you, who don’t like strong scents when it comes to facial skincare. Add to that the quality of ingredients and it becomes a no-brainer when the choice lies between a fairly cheap mainstream product and a more-expensive product that not only will last a while, but will actually make you skin look more loved and cared for. Nurture & indulgence in one compact bottle! The accompanying brochure, or the ‘Love Letter’ that I christened them,also offered ingredients insights, like the fact that the funnily named Camellia Kissi Oil acts as a morning tonic for the skin, rejuvenating the skin, while Watermelon Seed Oil was added for its powerful moisturising properties, without greasiness & pore clogging side-effects that some oils do have. There is also Natural Vitamin E, which many facialists recommend to have in your daily skincare, due to its antioxidant properties, as well as ability to fight the negative effect of environmental aggressors & assisting the process of cell renewal that slows down as we age. Personally I like the smell of this oil, particularly the combination of Cape Chamomile & Cypress, which also help to heal the skin, making it particularly effective for male skin post-shave and the sunny Sweet Orange, which lifts the spirits on glum & dark autumn & winter mornings & helps to brighten the skin, as the summer suntan slowly disappears down the drain. Well, suffice to say that this face mist had me at ‘hello’ with its name. Even now, several months after I first had its drops land on my face, when I glance it standing next to my laptop, it elicits if not giggles, but a smile for sure. It also has a zesty personality to match with its uplifting citryssy smell that’s hard to resist, especially on grey days that we are experiencing right now, as autumn turned into winter & we are on the fast-track to Christmas. The uplifting duo of hydro-essential oils of Melissa & Orange Blossom, along with Rosalena’s unique natural PlantPreserveTM is combined with the refreshing and energising scents of Organic Bergamot, Sweet Orange and Grapefruit essential oils make you feel, as the Frosties tiger would say ‘grrrreat’! The mist refreshes the skin with its dewy drops, while energising scent invigorates your senses & mind, when you feel like snoozing, rather than working. If that’s not a beautiful pick-me-up for autumn & winter, when shorter days & colder nights make us feel more lethargic, I don’t know what is. I will also admit to feeling more inclined to exercise when I work at my desk, after misting my face with Goodness & Tonic. Before I would come up with a lame excuse not to, stretch my legs and get on with typing or researching. Now I mist, inhale, finish typing & take a half an hour break to do some targeted exercise. Having had the pleasure to use all of Rosalena’s products, as well as to get to know the humorous & hard-working team behind the brand, I am a convert. To top it up, I am more than happy to support women, who like me, combine work with motherhood, yet manage to inspire other women to take small steps towards big changes, notably not feeling guilty when we take the time to enjoy daily moments of precious ‘me-time’ with our skincare. To find out more about Rosalena & purchase its products please click here (the link is not affiliated).